Jeg jobber med maleri, grafikk (litografi, etsning) og lager også gicleé av utvalgte originaler. Jeg har eget verksted og galleri i Skrivergården i Larvik. Tone Flesche has a teachers degree, and she has a two year degree from University College in Oslo, specializing in etching combined with drypoint and calligraphy. She often combines gravure and high pressure, to accomplish the ‘pure’ graphic expression she is looking for. She has also recently focused more and more on her paint work, especially acrylic, and develops them into Giclee prints. Lithography is also a part of her expression. After many years working as a teacher for children, this truly inspired her naive and childlike artwork, her art is also meant to capture the adult viewers, through memories, thoughts, and humour, which are important factors in her work. 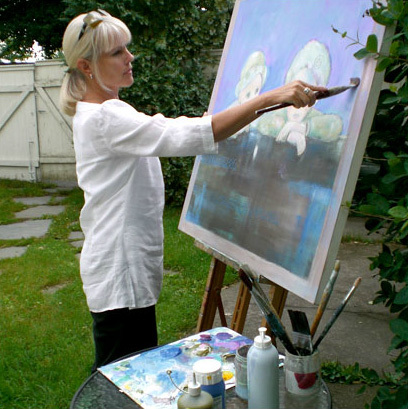 She is now a full-time artist with her own art gallery in Larvik, Norway.